Brazilian military police faced a sudden raging inferno during routine shotgun shooting practice on November 23rd. Two videos recently appeared on YouTube (below) showing the moments before and during the fire ignited in the floor in front of one of the officers. The fire appears to start on the floor in front of the shooter on the far left. It seems a spark from one of his rounds dropped into a crack in the material on the floor, causing something to start burning. In just two seconds the fire expands to fill the room, then retracts momentarily, and expands further. This is another angle from the back of the room. The timing is not synced and in this video the fire starts at 1:25. At 1:31 in that video the fire seems to have moved from the flooring to the walls. The agency involved is unclear but the word RONDAC appears clearly on the back of one uniform, which is military police in Brazil. 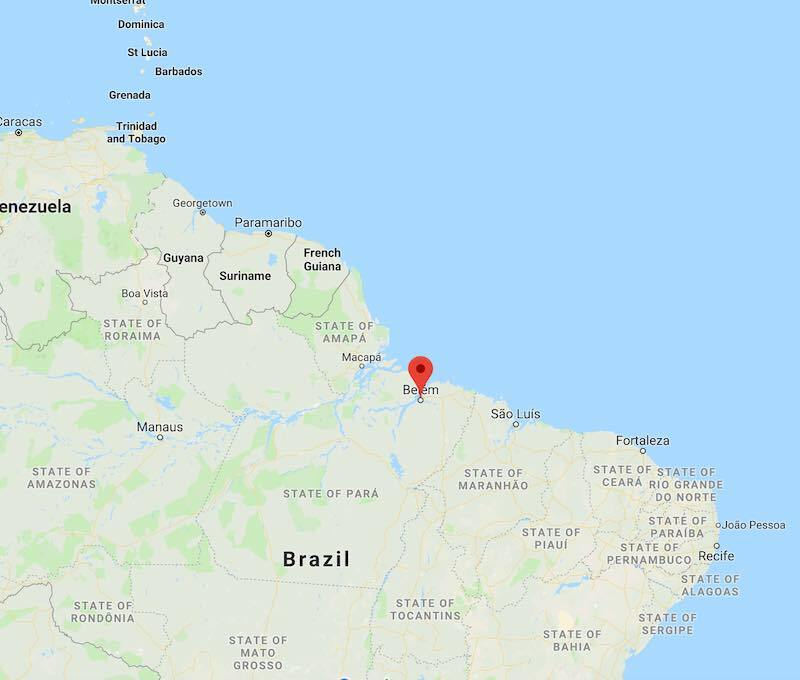 One of the videos indicates this is from the city of Belém, which is the capital of the state of Pará in northern Brazil. Image and map data from Google Maps. Both sources indicate that no one was injured in this incident, but we have not been able to find any reliable source to verify the full details of the incident. Since we have a lot of Brazilians living in West Boca Raton, Florida, we thought this story might be of interest to our readers. Early Sunday morning readers notified us of problems at the Walmart on Hillsboro and 441 in Coconut Creek. They saw fire rescue and police vehicles and indicated the store was closed and surrounded by crime scene tape. The store is still closed as of this writing. We reached out to Walmart as well as to Coconut Creek first responders. We heard back first from Leslie Wright, Senior Media Relations Manager at Walmart’s corporate office in Arkansas. She told us the fire is still under investigation and confirmed the store is still closed. They hope to reopen as soon as possible. She indicated the damage is still being assessed. The Coconut Creek Police Department referred us to Fire Marshal Jeff Gary of the city’s Fire Rescue team. He told us that a fire was reported inside the store Sunday morning at 2 am. The fire was mainly on one rack of shelves. Store employees mostly extinguished it and it was almost out by the time Fire Rescue arrived on scene. There was smoke damage to some produce and other open items including clothing. Mr. Gary told us that the store is now mostly or all cleaned up. They hope to be open late tonight or first thing in the morning. Cause of the fire is under investigation by CCFR and CCPD. On 04/10/2016 at approximately 0157 hours, I responded to 5571 Hillsboro Blvd (Walmart) in reference to a fire. A small fire was extinguished between aisle 17 and 18 of the check-out lanes by Officer Feisthammel and various Walmart employees. Fire Rescue located a large lighter directly in front of the engulfed aisle. Due to the heavy smoke within the store, all of the patrons and employees were evacuated and CCPD locked it down for security purposes. While on crowd control, Officer Bailey was approached by [Name omitted] (age 33). [He] stated his son, [name omitted] (age 6) was possibly to blame. [Omitted] stated while he was checking out in an adjacent aisle, he lost sight of his son and stated he was possibly playing with a lighter. Ofc. Bailey spoke with [the boy] who acknowledged playing with a lighter. [The boy] was crying uncontrollably and stated he was sorry for his actions but did not directly admit to starting the fire. The assistant store manager … stated Walmart will be able to provide CCTV surveillance in the near future should it be needed. Centeno notified the stores GM … of the incident. Both [managers] are aware of the … family and the actions of the 6 year old. There were no injuries reported as a result of the fire. Photos of the fire were taken and submitted to Foray as evidence. Case cards issued. The police report indicates the family lives in the Emerald Bay apartments at Boca Entrada (west side of 441 near SW 18th). Around 10 am today we were tipped off to a situation at Mission Bay Plaza. Readers and friends told us that there was a heavy police presence along with fire trucks. We headed over and took both pictures and video. The main part of the story is a “suspicious package” that was found in the parking area between TD Bank and Bank of America. You can see a wide version of the scene in our photo at top. It took some time but eventually the Sheriff’s “EOD” team (Explosive Ordnance Disposal or bomb squad) determined that the package was safe to handle. In the sequence of photos below you can see an armored bomb squad member approach it, pick it up, and then start bringing it to their truck along with another team member who is even more heavily armored. PBSO tells us this was not the package in question, but watching it on scene we don’t see what else it could have been. There was something else made up of an umbrella, some sort of plastic container with a water bottle and some coins. Please note that all photos in this article are copyrighted by Warren Redlich. Media are welcome to reuse them by simply crediting @WestBocaNews or WestBocaNews.com. Most photos are available in higher resolution just by clicking on them. There was a lot of police and fire rescue activity around the plaza. A large section of the parking lot and the area around the two banks were evacuated and blocked off by police tape. The bomb squad truck was in operation near Bank of America. After the package was secured, the heavily armored bomb squad team member got some help getting the helmet off. We received a call from Bank of America, located on Glades Road and 441, of a suspicious package. Deputies arrived evacuated both Bank of America and TD Bank then contained the area until Bomb and Arson arrived. Bomb and Arson arrived checked out the package and determined that there was no threat. Both banks were opened to continue business as usual. Here's our initial report from the scene at Mission Bay this morning. Our full report is coming soon. Our final video on the Mission Bay Bomb Squad incident. We will also do an article. Pictures at the end of the video. Fire Rescue reports a kitchen fire on Somerset Drive, now under control. As of 3:24 pm, the fire is out and investigators are expected on site soon. Various regional media covered the fire in the Loggers’ Run townhouse community Timberwalk. Below is video from WPTV. This occurred on the 11600 block of Timbers Way, south of Palmetto Park Road along Judge Winikoff just west of where it meets Ponderosa.